The Oracle of Eve speaks: "Looking ahead to 2010, come up with either realistic predictions of new EVE features, or wild speculations of what might happen in game during the course of the year." Y112 is over. Let us remember how the masses became more powerful and how communication made the universe so much more eventful. It all began with the implementation of a CONCORD-sanctioned communication technology generally known as New Eden. Specifically, the events that shaped the cluster in such a decisive fashion were made possible by the introduction of so-called transwarp microblogging, some time after the Dominion Wars. Quite simply, transwarp microblogging allows any licensed capsuleer to communicate instantly with as little or as many of his peers as he wishes. Corporations leaped on the opportunity to enhance their internal communications. In time, capsuleers developed commercial services with this technology and discovered its paradigm-changing potential. It all began with a mercenary venture which broadcasted short-term needs for military support to licensed dogs of war. The service had humble beginnings. If you were trapped in a solar system, you could potentially buy within the minute protection from random thugs in the vicinity thanks to the mercenary broker's extended network of followers. A low-sec outfit later stationed cyno-enabled ships in countless systems. Alliances attacked by surprise began to summon "cavalries" of carriers on top of their threatened space stations. Another broker specialized in selling the services of freelance covops pilots. Content delivered with transwarp microblogging is not meant to be archived but consumed on the spot. Pilots must act fast to seize an opportunity when they see it. They have less time to think about any given piece of information. Scammers, threatened by the rise of corp-branded storefronts, found here another venue for their carefully crafted lies. The market changed, too. Professionals of contract trading switched massively to this platform, making the specialist economy that much more fluid. Goods became to move more quickly, as offer and demand benefited from enhanced communications. Some began to use the technology to organize parties in stations, communicating about time and location at the very last time to their select followers. "Barbarian orgies" were also organized by charismatic pirate overlords. 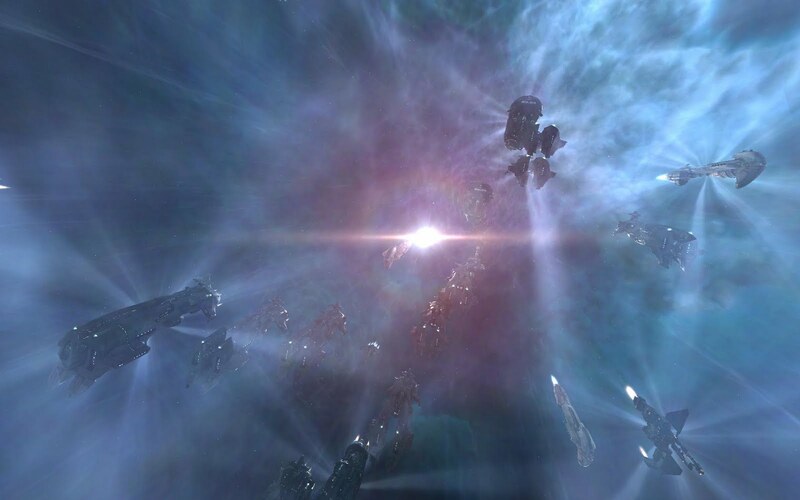 Provided with a star system and a target, unaffiliated followers would congregate from all parts of low sec and go on a rampage in a given location, destroying infrastructure and overwhelming resistance with swarms of ships. Many smart capsuleers have found ways to harness the power of the crowd. Today, corporations and alliances fear Joe the Nobody. The communication wars have begun.